my day has so far been filled with fun and creativity and family. who could ask for a better way to start off the weekend? i love your needle in the photo. & love this eastery looking bird. & love the bit of wild threads. I love the construction of this sweet little bird. So pretty. Thank you for sharing those wonderful links. I just always find peace here! Thank you! i think the sister of this bird is decorating a card on the fridge in my kitchen... always love your friday links. I'm usually not one for pastels but this is a fabric that just catches you. 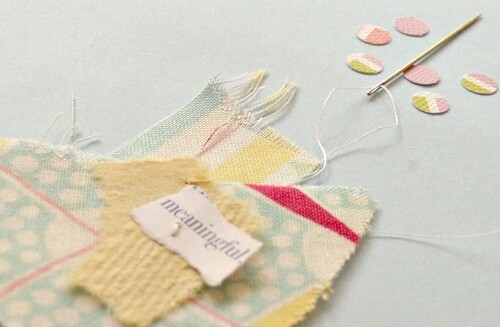 I have little snippets of pieces that I would never throw because they are perfect like this. What a soothing end-of-week reverie of links to explore. Thanks for the "filled with purpose" link to the Operation Bunny Drop post! and light I may miss otherwise. the edges of this precious piece have me captivated. I love your sweet, spring bird! Happy Weekend! LOVE the colors in this little bird, so full of spring. 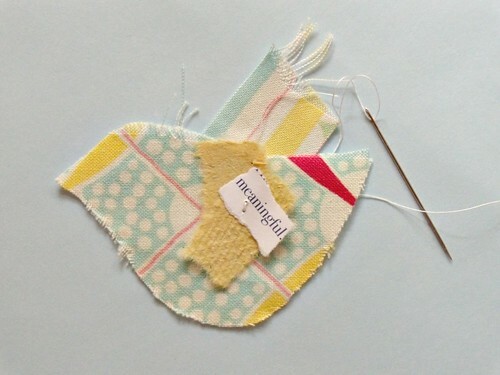 oh what a wonderful little spring bird - i like that you included the needle and thread too. You always have the best links. That painting! Looks like the pretty pastel birds are heading in just in time for Easter. I love the colours in this bird. But mostly I love the pic of Sam in the post below. i love your colors here.....i really do ! so springy and smiley !! so calm and relaxing here...i needed that. thanks for being such a good friend...even without knowing it. one love.